Paul McGinley is enjoying his golf again. 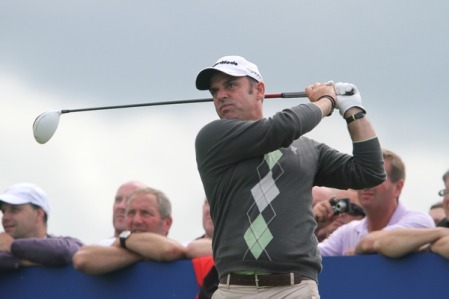 Photo Jenny Matthews/www.golffile.ieOld hand Paul McGinley believes having fun is the key to performing in his Roaring Forties and challenging for Irish Open glory. The smiling Dubliner might be 45 and struggling with a swollen left knee but he still insists he’s got enough in the tank to shine at the end of his career. McGinley got off to a lightning start in the second round with an eagle three at the 10th and back to back birdies at the 12th and 13th. But after following a bogey on the 14th with a birdie at the par-five second to remain on seven under, he bogeyed two of his last three holes. Disappointed to follow a dropped shot at the tough seventh with a four-putt from the valley short of the ninth, McGinley said: “Overall it was a good round of golf and if I had made birdie on that last hole we would be having a different conversation about how well I’m playing and that I’m right in the thick of it. “That’s the fine margins you have in professional golf but I can’t blame fatigue. “I slept great last night, I got off to a great start but the back nine played tough with those squally showers and the wind was coming into us more on the back nine. While he’s without a win for seven years, McGinley has had three top 10 finishes in his last four events. And while he needs a top-two finish in Ireland to qualify for the Open on Sunday through a mini Order of Merit, he’s not ruling out a big week. He said: “You never know in this game. Luckily it’s not a physical game like soccer or Gaelic Football, where you’re done in your thirties. The three-time Ryder Cup hero reckons he could be playing some of the best golf of his career right now but knows he has to be careful not to overdo it. He said: “There are glimpses of it being as good as it’s ever been, better than it’s ever been. “One of the reasons why I’ve played well this year is that I’ve cut down my schedule and I’ve been a lot fresher when I’ve played. “My knee is not 100 per cent and it will never be 100 per cent. It’s badly swollen now and that’s always the case, after every round it’s always swollen. As for the rash of low scoring damaging potentially damaging Royal Portrush’s chances of getting the Open Championship again, McGinley said: “I don’t think so. I think the R&A see the bigger picture. “The big picture is how the town of Portrush has been able to handle such a big event with record crowds. The other big picture is the quality of the golf course. 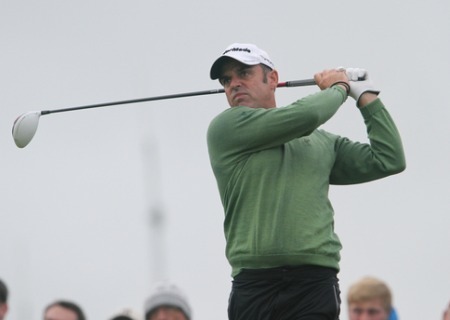 Paul McGinley is keen to maintain his good form. Photo Jenny Matthews/www.golffile.iePaul McGinley admits his dodgy knee is a major worry as be bids to stand out as a Ryder Cup captaincy candidate. Paul McGinley. Photo Jenny Matthews/www.golffile.iePaul McGinley donned his course designer’s hat and warned the R&A - Don’t mess with Harry Colt.